A 46-year-old man presented to the Department of Orthopaedics and Traumatology, Pamela Youde Nethersole Eastern Hospital in February 2004 with a 3-month history of self-detected left thigh mass. It was of spontaneous onset with no history of trauma, associated pain, weakness, or numbness. The patient had full range of movement and no lymphadenopathy was noted. 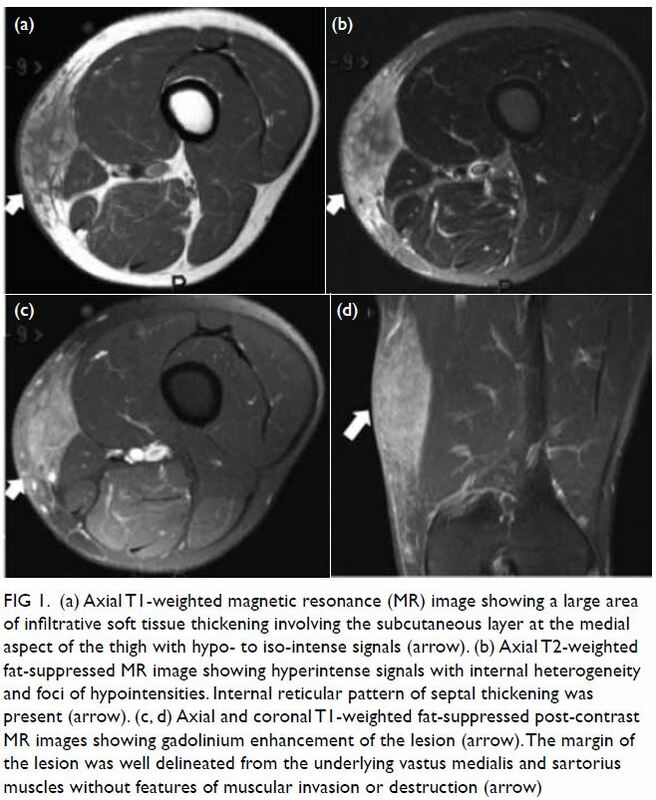 Magnetic resonance imaging (MRI) [Fig 1] revealed a large area of infiltrative soft-tissue thickening at the medial aspect of the left distal thigh and involved the subcutaneous layer. The lesion measured 8.4 × 3.4 × 11.2 cm (anteroposterior × transverse × longitudinal) and was characterised by T1-weighted (T1W) hypointense to isointense and T2-weighted (T2W) fat-suppressed hyperintense signals with internal heterogeneity. Internal foci of hypointensity in the T2W fat-suppressed images were noted. An internal reticular pattern of septal thickening was also found. There was enhancement after gadolinium contrast administration. The margin of the lesion was well delineated from the underlying vastus medialis and sartorius muscles with no features of muscular invasion or destruction. The knee joint was unremarkable and bone marrow signal was normal. The neurovascular bundle was also intact. Overall features were non-specific for either inflammatory or neoplastic pathology. Microscopic examination of an incisional biopsy over the left vastus medialis with a wedge of skin and subcutaneous tissue revealed infiltrate in the subcutis and to a lesser extent the deep dermis. The infiltrate consisted of lymphocytes and a low number of plasma cells. Immunohistochemical stains showed mainly T-cells and some B-cells. Occasional areas with aggregates of paler histiocytic cells were present and suggested granuloma formation. Stains for acid-fast bacilli and fungus were negative. The paler histiocytic cells were S100-positive and showed lymphophagocytosis (Fig 2). Molecular study by polymerase chain reaction showed no clonal T-cell proliferation. The overall features were suggestive of Rosai-Dorfman disease (RDD). Radical excision of the lesion was performed subsequently and included the epimysium of the gracilis, sartorius and aponeurosis of the vastus medialis. The excision margin in the radial excision of the lesion was 2 cm. Microscopic examination revealed that the mass in the subcutis was composed of nodules or aggregates of lymphohistiocytic cells separated by areas of fibrosis. The cellular aggregates were composed of dark areas with plasma cells and lymphocytes and pale areas with clusters of histiocytes. The histiocytes showed round vesicular nuclei, distinct nucleoli, and abundant foamy cytoplasm with presence of emperipolesis (phagocytosis of plasma cells and lymphocytes). The histiocytes showed positive immunostaining for S100. Special stains for acid-fast bacilli and fungus were again negative. The overall features were consistent with RDD. The resection margins were unremarkable. The patient recovered well postoperatively. Eight years after the operation, the patient detected a nodular swelling over the inferior margin of the surgical site. 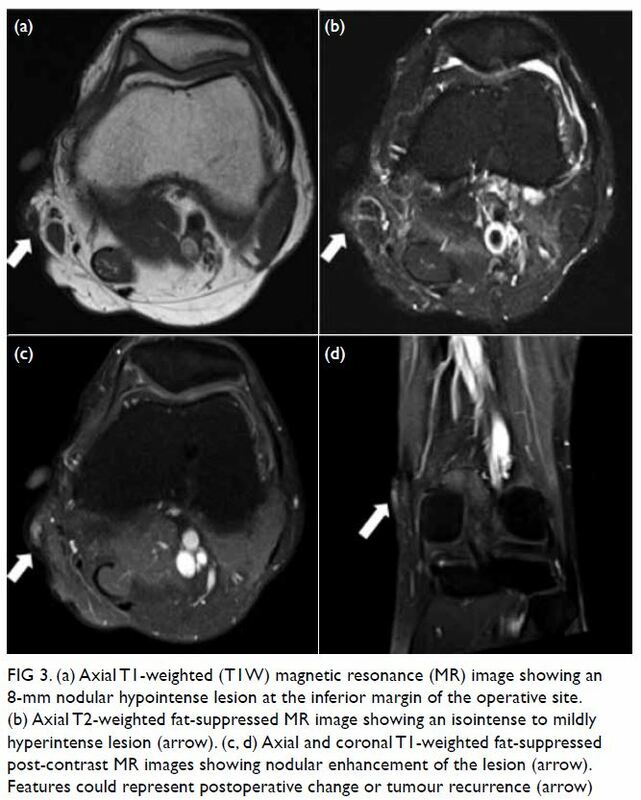 Serial MRI showed a static nodular T1W hypointense, and T2W isointense to mildly hyperintense soft-tissue lesion with contrast enhancement, measuring approximately 8 mm in diameter (Fig 3). Features could represent postoperative change or tumour recurrence. The patient was otherwise asymptomatic and he opted for follow-up scans to monitor the lesion instead of surgical excision. The aetiology of RDD is unknown, although previous studies have attempted to relate RDD to infectious agents including Epstein-Barr virus, human herpesvirus 6, herpes simplex virus, Brucella, Klebsiella rhinoscleromatis, and Nocardia.4 The disease involves a wide distribution and can affect a multitude of organ systems, including nodal involvement and extranodal involvement. The majority of patients present with painless massive cervical lymphadenopathy. Most patients have a complete and spontaneous remission, but some may experience recurrent or persistent albeit stable lymphadenopathy. In rare cases, the disease may follow an aggressive course and be fatal. Histologically, RDD is characterised by sheets of large pale histiocytes with large, round, vesicular nuclei. Phagocytosis of lymphoid cells or neutrophils by histiocytes may be found (“emperipolesis”). Immunohistochemical stains are useful when diagnosing RDD and the most consistent and reliable phenotype for RDD is S100 positive and CD1a negative. Relative to the wide disease spectrum, there are variable radiographic features. Although no specific imaging characteristics allow differentiation of lymphadenopathy in RDD from the myriad other disease processes, massive painless bilateral cervical lymph node enlargement, particularly when it occurs in children and adolescents, should prompt consideration of RDD as a differential diagnosis. Nodal involvement may be evidenced as lymphadenopathy. In computed tomography scan of the sinuses and brain, polypoid masses, mucosal thickening, soft-tissue lesion of the paranasal sinuses or nasal cavity with or without associated osseous erosion can be seen. Features of brain involvement include a hyperattenuating meningeal-based mass showing contrast enhancement or parenchymal oedema surrounding the lesion. In MRI of the sinuses and brain, sinus lesions may also demonstrate hypointensity on T2W images. Meningeal-based mass lesions may demonstrate T1W isointensity to grey matter, T2W hyperintensity to grey matter and homogeneous contrast enhancement.6 Gallium scanning may show increased uptake and increased metabolism with fluorodeoxyglucose positron emission tomography. The differential diagnosis is broad and includes infectious (granulomatous) disease, Wegener’s granulomatosis, other histiocytosis, Hodgkin’s and non-Hodgkin’s lymphoma, and fibroinflammatory lesions. In general, RDD does not show bone or soft-tissue destruction as in cases of Wegener’s granulomatosis and T-cell lymphoma. Rosai-Dorfman disease usually follows a benign and self-limiting course with treatment largely targeted at controlling local manifestations. Surgical options may be warranted for symptomatic control. This study was conducted in accordance with the Declaration of Helsinki. The patient provided written informed consent. 1. Rosai J, Dorfman RF. Sinus histiocytosis with massive lymphadenopathy. A newly recognized benign clinical pathologic entity. Arch Pathol 1969;87:63-70. 6. Symss NP, Cugati G, Vasudevan MC, Ramamurthi R, Pande A. Intracranial Rosai Dorfman disease: report of three cases and literature review. Asian J Neurosurg 2010;5:19-30.